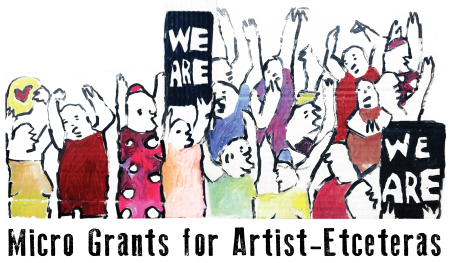 This summer Valley Art Share is launching a series of mutual aid micro-grants for artist-etceteras as a means to build a grassroots sustainable infrastructure for creative projects. Valley Art Share will source funds from its member-base and the community-at-large in small monthly installments that will contribute to a collective fund. This collective fund will be redistributed back to Valley Art Share members through a proposal process and a member-based voting system. The Valley Art Share micro-grants are inspired by alternative funding strategies such as F.E.A.S.T, Sunday Soups and Tandas, that create ways for a community to support each others’ creative projects and daily needs rather than relying on outside funding sources and institutions such as foundations, banks and wealthy patrons. F.E.A.S.T (Funding Emerging Art with Sustainable Tactics) and Sunday Soup, a project of inCUBATE are two models that invite people to an affordable dinner whose proceeds are democratically granted to creative projects proposed over the course of the evening. F.E.A.S.T has been used locally by Now for Art to support Northampton area artists. A Tanda is an alternative economy practice familiar in chican@ communities that functions as a rotating credit association in which members pool resources each week and receive funds from the collective savings on a rotating basis. Through its micro-grants Valley Art Share strives to foster mutual aid and a high level of community accountability and transparency by creating an accessible funding platform in which the entire granting process —from application and review, to voting and distribution of funds— is available to all its members. Valley Art Share membership is open to anyone living and/or working in the Pioneer Valley. The first grant round is now open for proposals. Valley Art Share members are invited to post one proposal every 3-month grant cycle. Grants are limited to one per member per year.